Starting with cooked beef shaves minutes from the prep time in this quick and easy dinner recipe. 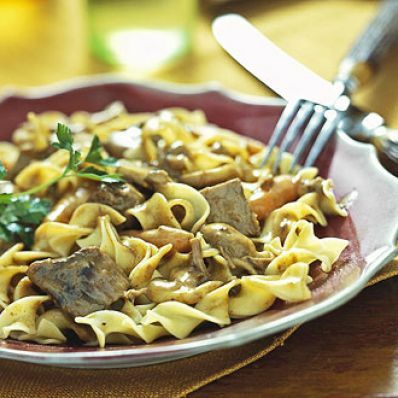 The saucy stroganoff is brimming with mushrooms, carrots, and chunks of brisket. 1 of 3 Heat 1 tablespoon butter in large skillet. Add onion; saute over medium heat until softened, 5 to 7 minutes. Add mushrooms; saute until mushrooms release their liquid, about 5 minutes. 2 of 3 Meanwhile, bring large pot of water to boiling. Add noodles and cook according to package directions, adding 1/2 teaspoon salt. Drain noodles in colander; return noodles to pot and toss with remaining 1 tablespoon butter. 3 of 3 Add brisket in gravy and carrots to onion mixture in skillet. Heat through, 7 to 10 minutes, stirring occasionally. Stir in sour cream; heat gently, without letting the mixture come to a boil. Serve the beef mixture over the buttered noodles. Per Serving: 4 g fiber, 600 mg sodium, 25 g Fat, total, 49 g carb., 13 g sat. fat, 145 mg chol., 33 g pro., 553 kcal cal.